Scientists from Stanford University have developed a device that can scan blood and find signs of cancer, even at its earliest stages. Early detection will allow early treatment and greatly improve the survival chances of patients. Stanford University scientists have developed a system based on MagArray’s biodetection chips that are capable of detecting cancer-associated proteins in a blood serum sample in less than an hour. MagArray is a startup company in the Panorama Institute for Molecular Medicine, a not-for-profit incubator in Sunnyvale, California. The device was created using magnetic nanotechnology and can detect cancer proteins with a far greater sensitivity than that of existing commercial devices. As a result of this enhanced sensitivity, cancer can be detected at a very early stage, while there are relatively few proteins released into the bloodstream. One of the key researchers in this project is Shan Wang, a Stanford professor of materials science and of electrical engineering. His research group mainly develops magnetic nanotechnology. The new system intends to tag specific cancer-related proteins using magnetic markers. Since there are few magnetic particles in most biological systems, a magnetic mark added to a molecule would create a large signal on a screening of the blood sample. In relation to other detectors which use electrically charged or glowing particles as markers, the magnet based technology can obtain a clearer signal from a small amount of markers in the blood. The detector contains a silicon chip designed by Sebastian Osterfeld, a Stanford doctoral student in materials science and engineering. The chip contains 64 embedded sensors that monitor magnetic field changes. Attached to these sensors are “capture antibodies” which trap specific cancer-related proteins as they pass through the sensor with the blood. At this point a second portion of antibodies is added to the sample. They attach themselves to both magnetic antibodies and the cancer biomarkers that are already held by the sensor. As a result, the MagArray sensors detect the magnetic nanoparticles together with the cancer markers. The researchers estimate they can detect cancer protein levels 400 times lower than the level required for detection by an existing cancer protein detection technology, known as ELISA. The device can detect more than one protein biomarker during one test. This is important for two main reasons, says Wang. First of all, scientists are still not sure which biomarkers are the best indicators of cancer presence. Second, the more biomarkers are recognized at one time, the easier it is for the doctor to profile the situation, understand exactly what type of cancer the patient has, and suggest the most suitable treatment plan. However, cancer protein detection could not simply be conducted at home as a means of self-diagnosis. In order to run the test, a technician must use a centrifuge to separate the serum, which contains the markers, from the blood. Therefore, the device must be located in a hospital or a private diagnostic lab. The detector may have an additional use as a quick test for a heart attack, for patients arriving with chest pain to the emergency room. Heart cell death is also associated with the release of specific biomarker proteins which can be detected by the device. But before any of these ideas come to life, clinical trials must be conducted to gain regulatory approval. 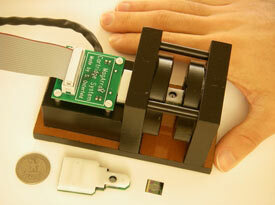 TFOT has recently covered other means of using a magnet to detect cancer. One such story covered a technique of capturing cancer cells with magnets and guiding them out of the body, developed by scientists from Georgia Tech. Another story covered the use of a magnet controlled camera for esophagus imaging which could detect early cancer growths, developed at the Fraunhofer Institute for Biomedical Engineering in Sankt Ingbert, Germany. For more information on the new cancer detection technology, please visit the Stanford University press release.